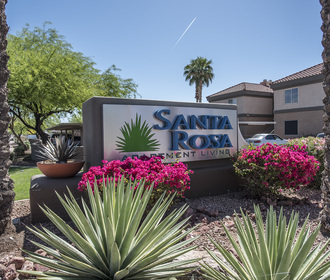 Bringing a resort-style atmosphere to the Valley of the Sun, Santa Rosa’s modern apartment homes provide a refreshing getaway in the Ahwatukee Foothills neighborhood of Phoenix. Complete with high-end finishes and convenient features, the one, two and three bedroom floor plans welcome you home. Each pet-friendly home combines classic details with a modern design, such as nine-foot ceilings with crown molding, to create an inviting atmosphere. Hardwood floors, accentuated by the beige-tone walls, flow throughout the common area. Behind the granite-topped breakfast bar, the modern kitchen is sure to impress with plenty of natural wood cabinetry and efficient appliances in stainless steel or all-black finishes. 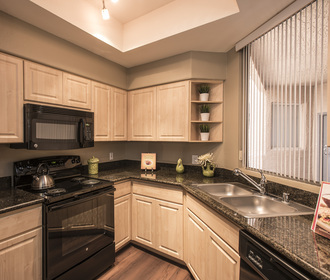 Along with walk-in closets in the bedrooms, additional storage is available throughout each apartment. While access to a private patio or balcony comes standard in every floor plan, wood-burning fireplaces are available in select homes. 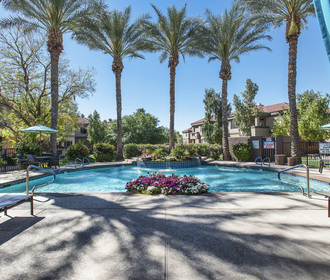 Santa Rosa’s renovated amenities offer a relaxing escape from the blazing Arizona heat. Make a splash in the swimming pool, or stay cool in the clubhouse with flat-screen TVs and billiards. Other amenities include a fully stocked fitness center and poolside barbecue grills. Contact the friendly Santa Rosa leasing staff to schedule a tour of the community.